Ready to review geometry concepts? 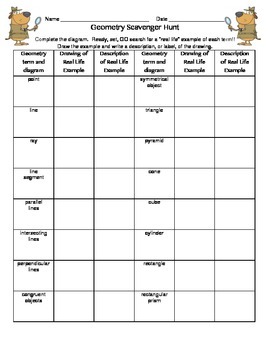 This is a fun tool for students to find real examples in their world of specific geometric concepts. Students are asked to draw a diagram of the concept, then draw and label an example that they find in their world. 16 geometric terms are included! This is a great "midpoint" activity because it includes lines, shapes and solids, but not angles.